When the term ‘arena rock’ is used, the first acts the usually come to mind are ones like Nickelback or the Foo Fighters, bands that have reached such a level of enormity through no-frills, straightforward rock songs designed for universal appeal. Biffy Clyro are undoubtedly a band that now also belongs in that bracket, but the number of people who’d have believed that to be the case in the band’s earliest days – the days when Scottish trio peddled some of the most juddery, off-kilter alt-rock going – could have probably been counted on one hand. Then Puzzle happened in 2007, smoothening their sound out while still retaining the odd quirk. Since then they’ve released two of the best British albums released in recent years, 2009’s Only Revolutions, an album which is still as close to perfection as a rock album is likely to get, and 2013’s Opposites, a sprawling double album throwing both the angular and anthemic together for a shockingly cohesive fusion of the two. But what’s next? After their biggest, most creatively fertile release to date, how do Biffy Clyro possibly follow on from that? According to Ellipsis, they strip everything back, scatter around the regular dosage of experimentation and go from there. But with this album, something feels off. The current, arena-conquering incarnation of Biffy has previously prided themselves on some of the most bombastic modern rock anthems going, but by comparison, Ellipsis feels a lot more insular. Lead single Wolves Of Winter is probably the instance closest to what the trio has become known for in recent times, namely massive riffs with a bit of angularity and a chorus that could knock festival crowds for six in its sleep. But it’s one of the few moments where that’s the case; instead, Ellipsis focuses on projecting its sound to a much more condensed degree, and as a result, it’s a bit of a mixed bag. The area where this assertion holds the most water is in the ballads; what are usually the colossal, embellished trump cards in Biffy’s deck feel surprisingly weak here. Re-Arrange, a track serving as a love letter to frontman Simon Neil’s wife, is suitably delicate and gentle, but the trap-style drums sour the mood drastically, and even the lush strings on closer People can’t revive the track from drowning in its own syrupy miasma. They probably come off the worst from Biffy displaying their more intimate side, as not all of the more pared-back tracks fare as badly. The percussive Friends And Enemies sounds genuinely massive with its thudding tribal drums and children’s choir, and is just begging for an airing during their upcoming Reading & Leeds headline sets, while Small Wishes is a quaint little oddity that falls somewhere between Waylon Jennings and an obscure TV theme tune, complete with superfluous but charming wolf howls. Fortunately the more conventional tracks are a bit more consistent in their quality. But while this might be the case, even at its best they can’t match up to some of the beasts that the band have in their back catalogue. There are definitely a few tracks that stand out as the potential radio smashes – the sharp funk bassline of Flammable and the absolutely joyous standout Howl are both obvious contenders – but even then it’s difficult to find anything that really sticks out, given the competition from the rest of the canon. These aren’t bad songs by any means, but they don’t nearly pack the same amount of weight or appeal as what’s come before them. And with tracks like the messy Herex, a track which seriously attempts to integrate blastbeats amongst rumbling, Weezer-style guitar and jaunty piano lines, the album becomes weighed down too much for it to really fly. It’s unfortunate that this is the case, as while Ellipsis is far from a terrible album, it’s likely to get tarred with that brush given the proximity to the future classics in Biffy’s discography. Rather, it should be seen as a transitional album – in terms of testing the waters for what this newest phase of the band has to offer, it does enough for the next release to really take off. But as it stands now, Ellipsis is a solid if unremarkable inclusion into a lineage that has historically been anything but. 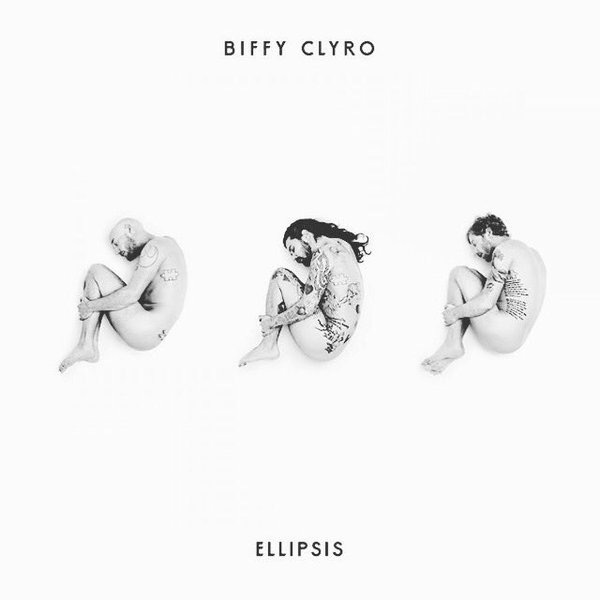 ‘Ellipsis’ by Biffy Clyro is out now on Warner Bros. Records / 14th Floor Records.